I dyed at my quilt guild's dye party. The bright blue up front is a piece of silk organza and the rest are 100% cotton. I love the way the silk takes the color. Actually I think one of the greens in the back is also silk organza. I'm looking forward to playing with these new pieces. After having so much fun with batiking and dying this summer, I decided to take a side trip while I was on vacation to Dhrama Trading in San Rafael. My friends and I have ordered from their catalog (I bought the silk from them) but until last year none of us realized they had a stone and morter store as well. It's amazing how excited a person can be about something so simple (and let me tell you I was not the only one getting excited.) I just had to go and experience everything I had seen in the catalog and online. The store was simple and amazing. It contains practically everything the catalog does. The main section of the store if filled with yarns and knitting supplies. A room off to the side is filled with all sorts of dyable fabrics, and the third room in the back is filled with clothing items ready to dye as well as dyes and paints. They also have fun books and lots of beautiful samples hanging up. The staff was very friendly and helpful, answering many, many questions for me without getting tired of me. Or at least not acting like they were tired of me! I was a bit overwhelmed by everything but after a look around I decided that I would take the plunge and buy some dyes to use on my own. (I've never dyed without the help of Anne, the Batik Queen.) I picked out 6 dyes (random colors that I liked the looks of), a few other dye materials I would need, a couple pieces of clothing to dye, and a canvas bag to dye. I was very excited by my purchases. However, after I left and I was half way back to my Sistah's house I realized I had not only forgotten to look for the paintstiks I wanted to buy, but I also forgot to buy fabric to dye. Oh well, next time I go to visit Sistah I'll just have to make another side trip to San Rafael. Very pretty. We've ordered from Dharma but the store would be a bit of a drive for us to go for fabric. 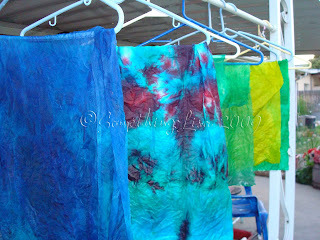 The dyes are wonderful and they last and last.